Attractive and convenient, these clear packages are perfect for retail use for any industry - cosmetics, toys, candy, crafts - even POP displays. 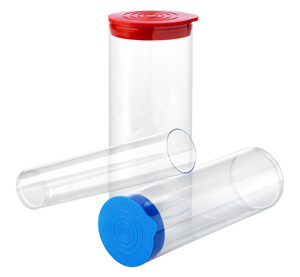 Rigid bottom containers feature a clear rigid bottom insert affixed to one end of the tube creating a permanently sealed end. VisiPak supplies the caps or plugs for the open end, and there is a large variety of closure styles and colors from which you can select. The Shaker Top Plug is available with the 1-5/8" propionate tube container.